A funeral mass is scheduled for 9:30 a.m. Monday, June 25, at Our Lady of Grace Catholic Church for Ramona Fierro Torres of Artesia. Torres, 84, was called home to our Lord Thursday, June 21, 2018, at Artesia General Hospital. Fr. V.J. will officiate the services, with interment to follow at Woodbine Cemetery. Visitation will begin at 2 p.m. today at Terpening & Son Mortuary. A rosary will be recited at 9 a.m. Monday at Our Lady of Grace. Ramona was born Jan. 28, 1934, in Santo Tomas, N.M., the daughter of Nabor and Paz (Hernandez) Fierro. On July 29, 1961, she married the love of her life, Candelario “Lalo” Torres, in Artesia. She was a beautiful wife, mom, grandmother and great-grandmother who loved her family infinitely. She was a generous and loving lady who had a passion for life and always saw the best in everyone. She will be greatly missed. 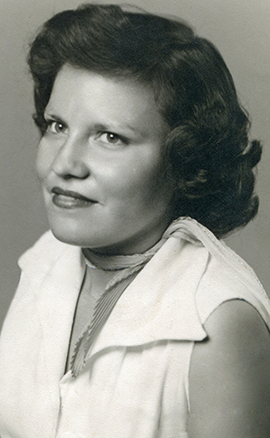 Survivors include her husband of 56 years, Candelario “Lalo” Torres; son Antonio “Tony” Torres and wife Denise of Thornton, Colo.; daughters Gloria T. Perez of Artesia and Yolanda T. Murray and husband Michael of San Antonio, Texas; sister Barbara Fierro of Thornton; grandchildren Crystal T. Perez, Serrina T. Gonzalez and husband Abraham, Israel “Bumperz” Perez, Eric Guadalupe Mesquita, Candelario Antonio Torres, Joseph Garcia and wife Hope, and Christina Maria Murray; and great-grandchildren Santana J. Perez, David Caesar Baca, Nehemiah X. Baca, Apolonia Baca, Abraham Gonzalez Jr. and Natalia Gonzalez. She was preceded in death by her parents; sisters Maria Galvan and Clara Fierro; and brothers Manuel Fierro, Guadalupe “Lupe” Fierro, Juan Fierro, Benjamin Fierro and Ramon Fierro.